Over time, we must admit, James Whale’s Frankenstein has lost its power to shock. What remains is its poetry, its stark beauty, and its enduring magic. Filmgoers in 1931 were terrified and outraged over Frankenstein. Today, children are entertained by its sparking mad lab, its quaint cemetery chills, and its sad sack monster. Then again, children always empathized with Frankenstein’s Monster. Boris Karloff noted that youngsters “could see right through the makeup and could see the tragedy of this poor creature, and express great compassion for him”. In January of 1984, patrons of the Pacific Film Archives at the University of California, Berkeley, were invited to introduce young people to Frankenstein — what a grand idea! — and were rewarded for it with a free copy of the poster seen above. The Monster’s skeleton (note the telltale neck bolt) appears trapped in clockwork machinery, pistons pounding at it from all sides. The bony hand threads a rose up through exposed ribs and into the chest cavity. A rose as red as a beating heart. 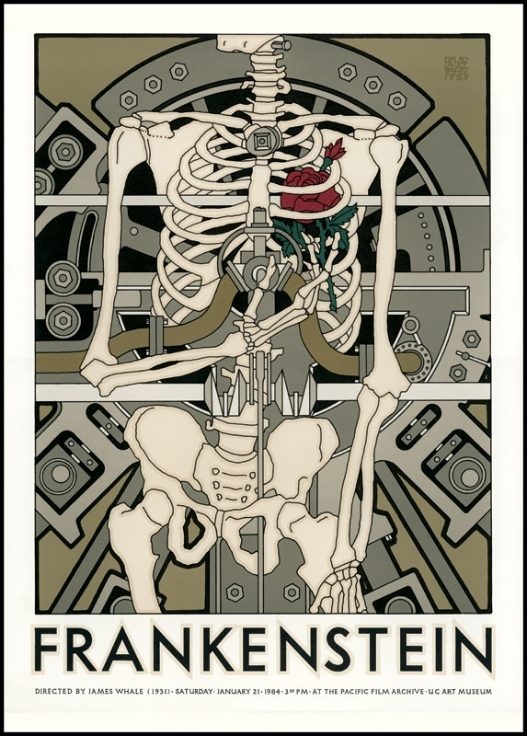 I must say, there are many hundreds of Frankenstein posters, but this my favorite one ever. The artist, David Lance Goines, is a giant in the world of graphic design. His style evokes Art Nouveau while being resolutely contemporary. His posters are like antiques from the future. Goines' considerable talents as an illustrator and calligrapher — not to mention heraldry and superb draftsmanship — are matched only by his remarkable skills as a printer. Goines oversees the entire process, controlling the quality of the piece from initial concept to final product. 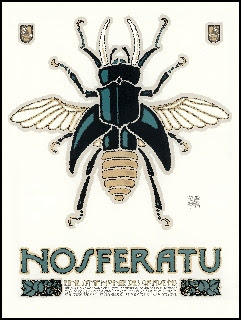 I've included a second piece here, a stinging-insect take on Nosferatu. There's lots more on Goines’ generous website. It literally overflows with images, all of them downright stunning.